The invoice price & true dealer cost are not the same. The true dealer cost of a Ford EcoSport is lower. Note: The Ford EcoSport pricing report below does not include rebates or incentives. View Ford Rebates and Incentives. Ford EcoSport Prices - How Much is a Ford EcoSport? The 2019 Ford EcoSport is a fun-to-drive, fuel-efficient crossover SUV that is available at an affordable price. With a wide range of standard features, the EcoSport offers the practicality and durability of a larger SUV for the same price as a compact sedan. The 2019 Ford EcoSport offers bold styling, an appealing array of options, and modern technology to create a fantastic driving experience. For 2019, the Ford EcoSport has been updated to improve its appearance and functionality. The 2019 EcoSport offers more standard features than ever before, with a standard heated steering wheel on the SES and Titanium models. All trims now include a standard windshield wiper de-icer. The 2019 Ford EcoSport SES includes a number of other cosmetic changes, including standard 17-inch aluminum wheels, a body-color rear spoiler, heated sideview mirrors, and a new grille with black painted bars. All 2019 Ford EcoSports are compact four door crossover SUVs. The EcoSport S, SE, and Titanium editions come standard with front wheel drive and offer optional four wheel drive while the EcoSport SES comes standard with four wheel drive. EcoSport S - The 2019 Ford EcoSport S comes standard with a wide range of equipment including a swinging rear hatch door, automatic start-stop technology, hill start assist, a rear view camera, intermittent windshield wipers, floor mats, a compass, two USB ports and two 12V power outlets, and a capless fuel filler. 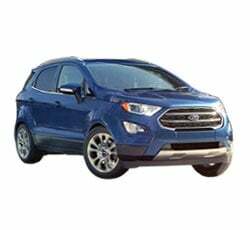 The EcoSport S comes standard with an efficient but powerful 1.0 liter three-cylinder turbocharged engine that makes 123-horsepower and achieves 27 miles per gallon in the city and 29 miles per gallon on the highway. The EcoSport S is also available with an optional 2.0 liter four-cylinder engine that makes 166-horsepower and gets 23 mpg in the city and 29 mpg on the highway. EcoSport SE - The Ford EcoSport SE adds features such as SYNC 3, a powerful technology that allows for interface between the car and your phone, including app integration and the ability to communicate with your phone's Siri directly through the vehicle. The EcoSport SE also includes a power moonroof, LED headlights, fog lights, and body colored door handles and trim. EcoSport Titanium - The Ford EcoSport Titanium significantly upgrades the interior of the Ford EcoSport. The Titanium trim includes a sliding armrest, leather seats, an 8-inch color touchscreen, a standard navigation system, automatic temperature control, Wi-Fi, a Bang & Olufsen 10-speaker sound system, and a 110-volt power outlet. The EcoSport Titanium includes standard 17 inch aluminum wheels and power, heated mirrors. For added safety, the EcoSport Titanium includes a standard perimeter alarm and Blind Spot Information System. EcoSport SES - With a sport tuned suspension, the EcoSport SES is designed for those who crave a sportier driving experience. The SES includes standard four-wheel-drive and the 2.0 liter 166-horsepower four-cylinder engine that is optional on the other trims. Inside, the EcoSport SES offers unique leather and cloth-trimmed seats designed for performance and comfort. Unlike the EcoSport Titanium, the EcoSport SES is only available with the standard seven-speaker audio system. The Ford EcoSport offers an exceptional value for the money. With a long list of standard features and a variety of different trim levels, the EcoSport can be tailored to suit the needs of almost anyone. Value-conscious shoppers can find a well-equipped vehicle in the EcoSport S and SE, while those seeking a more luxurious experience will love the EcoSport Titanium. Those looking for performance and a sporty driving feel will feel right at home in the EcoSport SES. The 2019 Ford EcoSport is easy to drive - with compact proportions and a high seating position, you can feel confident whether you are driving down the freeway or parking in a tight parking space. With available technology that includes a rearview monitoring system and a blind spot detector, you will have peace of mind in nearly any driving situation. The interior of the 2019 EcoSport is well-equipped for all your needs, whether you are commuting a short distance or on a cross-country roadtrip. With Ford SYNC and available Ford SYNC 3 technology, the EcoSport provides the most up-to-date technology to integrate your phone with your vehicle's infotainment system. All EcoSports include two USB ports and two 10-volt power outlets so that you can easily charge multiple phones. An available 110-volt power outlet allows you to charge and use any larger device or appliance while on the road. With optional on-demand four-wheel-drive, the 2019 Ford EcoSport can tackle almost any driving condition. Unlike all-wheel-drive, on-demand four-wheel-drive gives you the fuel efficiency and handling of a front-wheel-drive car during good conditions while offering a more rugged and capable driving experience in the snow, mud, or sand. The 2019 Ford EcoSport is the perfect vehicle for anybody who wants an affordable, practical, reliable crossover SUV - head to your local Ford dealer today for a test drive. Example: Base Ford EcoSport invoice price + the dealer Invoice price of all the options + destination - Holdback = Total Dealer Cost. Note: All Ford EcoSport MSRP, invoice and dealer cost dollar figures above are approximate amounts. Prices are subject to change without notice.